Master Blaster Rewarded At Last! Sir Vivian Richards, double-winner of the Walter Lawrence Trophy, which is awarded for the fastest hundred of the season, finally received his spoils some three decades on during the Lord’s Test. 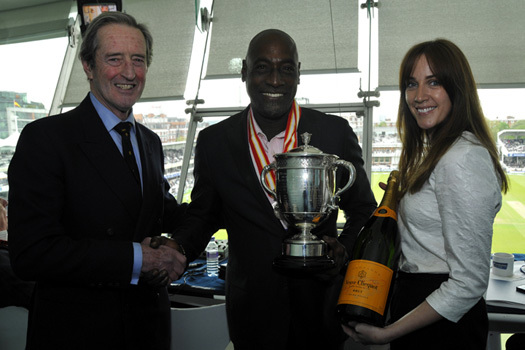 Brian Thornton presents Sir Vivian Richards with the Walter Lawrence Trophy and his medallions, while Lorraine Larmer, Senior PR & Communications Manager of Veuve Clicquot, is ready with the Champagne. The legendary West Indian batsman, who recently celebrated his 60th birthday, won the Trophy first in 1980, when it was awarded on time, with a 66-minute hundred for The West Indians against Glamorgan at Swansea. Six years later the luckless Glamorgan were once again on the receiving end as Richards blasted a 48-ball century for Somerset in the County Championship match at Taunton. 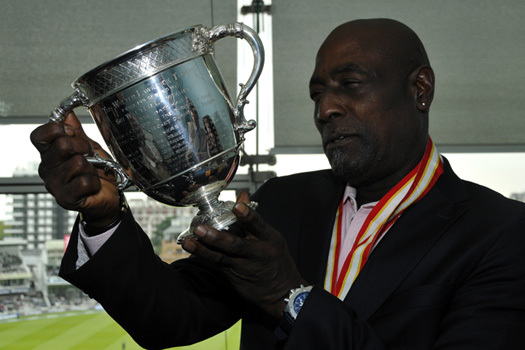 Sir Vivian Richards with the Walter Lawrence Trophy.